The 2018 Sea-Doo GTX 230 features a new hull and deck and is available with a Bluetooth audio system. It’s a big year for Sea-Doo’s GTX platform. Both hull and deck are all new, innovations abound, and there’s even an affordable option to set your ride to music. Add in a choice of engine options and you’ve got a craft ready to make its mark in 2018. Here’s a closer look at the middle option in the GTX lineup, the 2018 Sea-Doo GTX 230. Hull, deck and power all combine to deliver the thrills, but it’s the GTX’s newfound features that demand your initial attention. Start with bow storage. Recognizing the difficulty of accessing the forward compartment while out on the water (an awkward move that typically started with leaning waaaaay out over the handlebars to open the compartment and then stretching even more to still fall short of any contents within), designers moved the compartment directly in front of the driver. How? By taking the radical approach of having the entire handlebar/info display assembly lift open to reveal a compartment waiting literally at the driver’s fingertips. Yes, it’s smaller, 27 gallons compared to the former 42.8-gallon capacity, yet I hardly noticed the difference. Items are readily accessible right from the saddle; add the accessory organizer to divvy up the space and there’s seemingly a place for everything…and everything in its place. Worried about the integrity of the steering assembly? When closed, I noticed no play in either the compartment or handlebars. Completely new storage possibilities follow aft. Look closely at the rear deck area and you’ll note two pop-up cleats recessed into the surface. Pull them up and they act as anchoring points for a new series of accessories, including a Yeti-like, 4.2-gallon cooler ($280), 4-gallon gas caddy ($180), 5.5-gallon dry bag ($195) that can piggy back atop the gas caddy, and a retractable ski pylon ($300). Again, I was impressed by how solidly each anchored in place via a simple cam-style latch. I was also reminded how nice it is to shut off the engine, pivot in your seat, and grab a cold drink and snack out of an ice-filled cooler on a hot day, or have the comfort of a reserve gas supply when exploring. 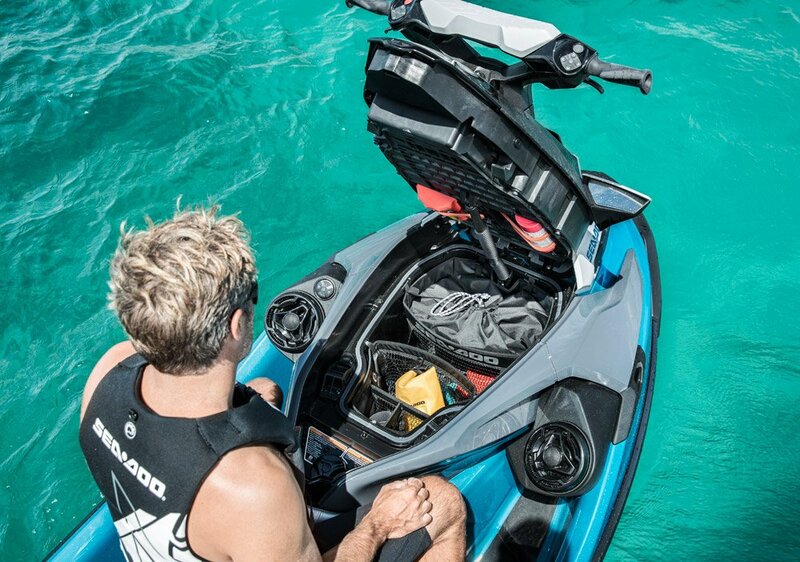 Even the seat of the 2018 Sea-Doo GTX 230 boasts newfound innovation. The latter half is now removable, lessening the weight for solo performance riders or expanding the deck further for those that want to use the space as a casting platform or a spot to hang out when coving with friends. The new hull is exceptionally stable, making both a reality. Shortcomings? 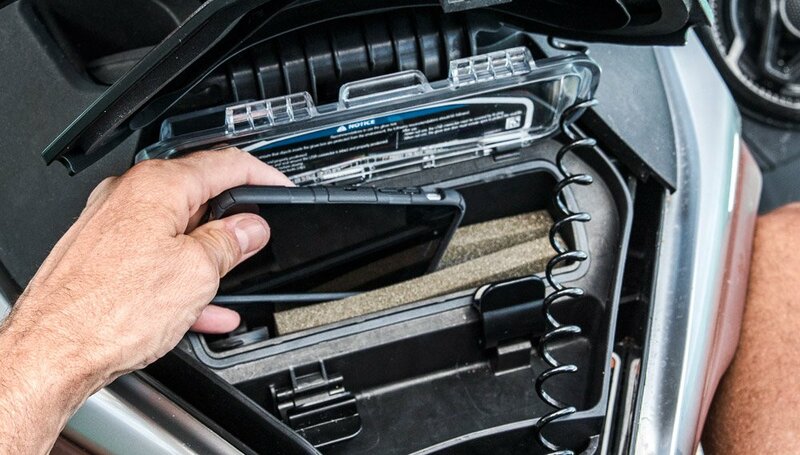 With the new bow storage, the glovebox has now pretty much just become a spot that holds a watertight case for your smartphone, but with purpose. That phone can now provide the playlist for the surprisingly affordable, 100-watt Bluetooth audio system. 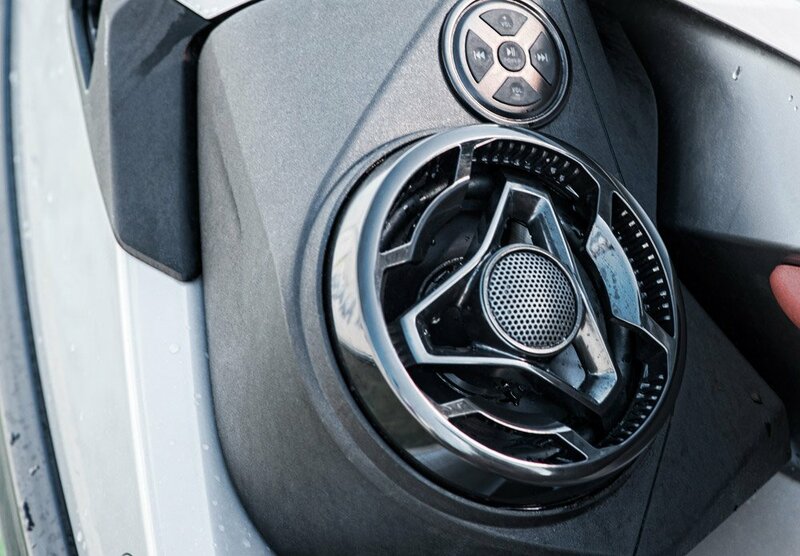 The option positions speakers directly below the mirrors in seamless fashion. A simple touchpad control above the left speaker controls volume and skips forward and back in your playlist, but it’s a little bit of a stretch to reach; I’d like to see it closer to the driver. Overall sound quality is great, however, and at less than $1,000, the price is right. With such an abundance of new features to play with, it’s easy to forget that the hull is what can truly make or break the craft for most riders. The GTX hull is now arguably a little closer to the nimble RXP-X. A slight reverse chine enhances stability, with a secondary chine widening the hull and improving at-rest stability. The entry is much sharper and pronounced than its 20-degree deadrise would attest, both to improve offshore handling prowess and quicken the craft’s handling in turns. Overall length has decreased by almost 3” in length while widening 1” in width. Weight has dropped by nearly 90 pounds. 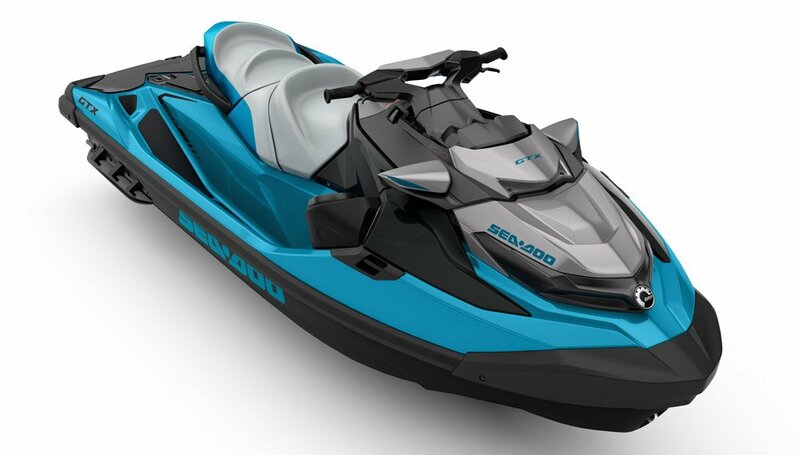 The result is a more aggressive ride, with lightning-fast directional changes and enhanced confidence in rough water. The craft is also more stable, both underway and at rest. The driver sits nearly 1.5” lower than before, passengers three full inches, to lower the center of gravity. Footwells are likewise recessed into the deck lower than before. I found I could stand in one footwell without tipping the craft. I could also board from the side, although with a drop-down boarding step awaiting at the stern, not sure why I’d want to…other than to prove the craft’s stability. As to how these changes affect performance of the 2018 Sea-Doo GTX 230, power-to-weight ratio has obviously improved, a fact felt most on the low-end. 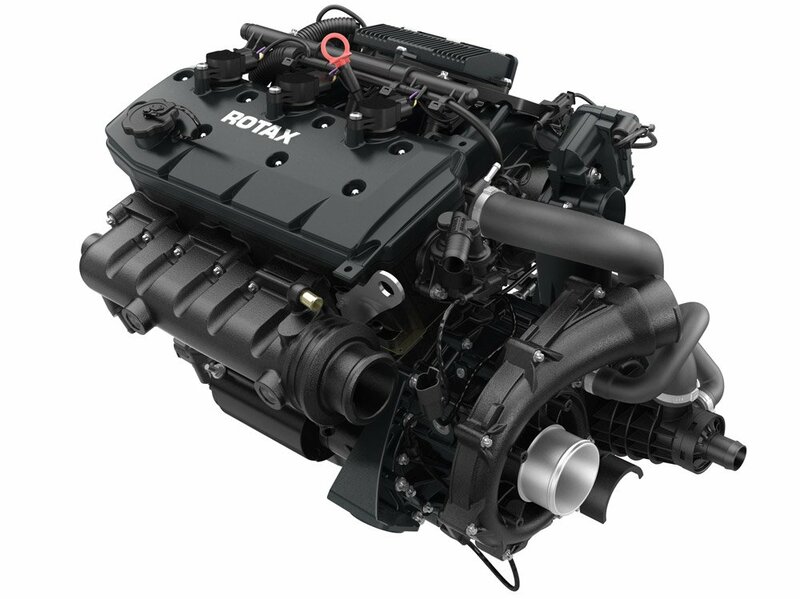 The Rotax 1500 HO ACE engine pumps out approximately 230 horsepower, and is lighter and more compact than the former Rotax 215. Squeeze the throttle and you’ll feel the surge provided by the supercharger-and-intercooler combo as the craft jumps rapidly onto plane before peaking at 67 mph. Dual acceleration profiles can tame that response to your liking; Touring mode softens the response while Sport mode gives you more rapid acceleration. An Eco mode can also be activated to achieve the best fuel economy when desired. As to other features, cruise control and no-wake modes are standard issue, as is a radio-frequency (RF) lanyard for security. A secondary lanyard can also limit top speed for newbie riders. The most useful extra, however, continues to be Intelligent Brake & Reverse. iBR allows the craft to start in a neutral mode and be toggled back and forth from forward, neutral and reverse via the throttle and iBR lever on the lefthand side of the handlebars. iBR also offers braking power at speed, rapidly slowing the craft by deflecting thrust. The GTX also gets Sea-Doo’s ErgoLock saddle to anchor the driver in place and allow the more powerful lower body to get in on the action and high-performance variable trim to fine-tune running attitude. As to toughest competition of the 2018 Sea-Doo GTX 230, Kawasaki offers nothing at this price point. The closest comparable model would be the more powerful Ultra 310X at $15,299. 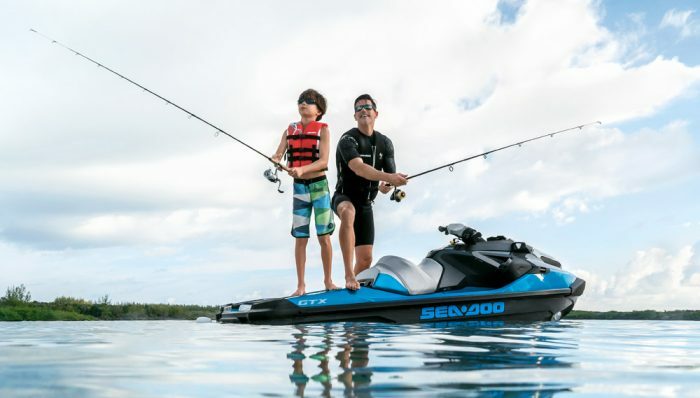 Yamaha’s FX Cruiser comes in $100 less and also features a versatile hull, strong power delivery, and extras including RiDE, Yamaha’s dual throttle system for forward, neutral, reverse and rapid deceleration. Get PersonalWatercraft.com in your Inbox!